In most cases, cat training is of direct benefit to the cat, helping him to adapt to different circumstances and situations. Before attempting any training session, make sure your cat is well and in a co­operative frame of mind. There is no point in trying to train a cat that is tired or off-colour, you will simply build up a pattern of resistance. Contrary to popular belief, a cat does like to please his owner, even if the way he shows it is not as obvious as a dog’s would be. Certainly the closer the relationship you have with your cat, the more progress you will make when it comes to training. There will come a time when you will have to train your cat to accept being restricted and moved from one place to another within the confines of a carrier. Some cats object to this, whereas others quickly adapt to the confinement and will settle quietly to sleep for the duration of the journey. Cat carriers come in a range of sizes and finishes. It is important that the carrier you buy is large enough to allow your cat to stretch himself, and also to curl up and sleep if he wishes. Many people start with a cardboard carrier, supplied by the vet. Although this may be sufficient for one journey, most cats will very quickly be able to escape by tearing a way out. A more permanent solution is needed. Equipment: A cat carrier, bedding, food treats. 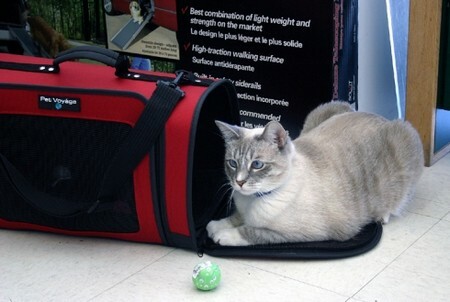 Training objective: To train your cat or kitten to sit comfortably, and without fear, inside his cat carrier. Introduce your cat to a carrier as soon as possible. Make the inside of the carrier as comfortable as possible with a bed or blanket. Your cat’s own bed or blanket will increase his feelings of security. Place some favourite treats, at the other end of the carrier and allow your cat to explore the inside confines. Allow your cat to take his own time to enter the carrier. This step should be repeated over a number of days until you are happy that your cat has accomplished his training. Once familiarisation has been achieved, close the door on the cat so that he learns he is restricted. This should not affect him unduly as he will recognise and feel comfortable in his carrier.